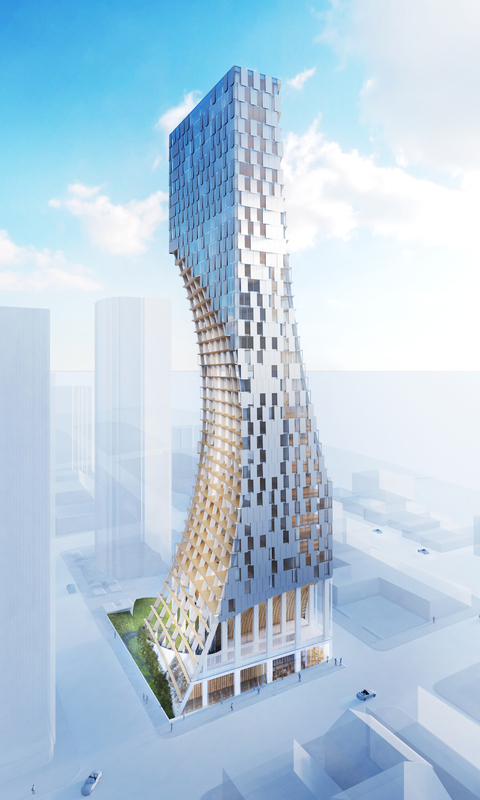 A uniquely shaped residential tower at 1550 Alberni designed by Kengo Kuma, a renowned Japanese architect, will be a new landmark in Vancouver when completed in 2021. Unlike any other classic Japanese shaped residential tower, this masterpiece is a world-class modern building with a visionary conception and intricate design details. The design was inspired by nature and shaped by the environment while respecting the Japanese spatial traditions. In particular the emphasis was set on the atmosphere rather than the object in order to create a serene visceral experience. The urban strategy aims to improve the city and its relation to nature. 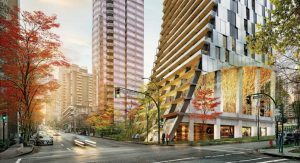 Developed by Westbank & Peterson Group this tower in Downtown’s Coal Harbour will visibly excite people from around the world. 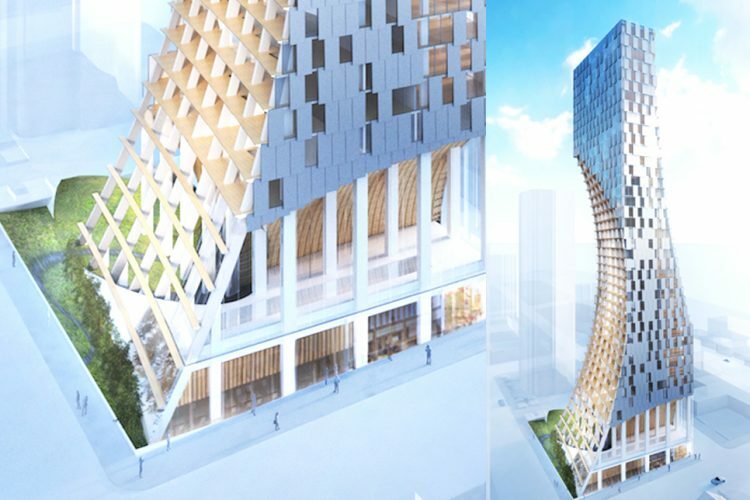 Inspired by the environment, the organic shape of this challenging 43-storey tower was designed with special curved concrete in combination with diagonally symmetrical deductions to counterbalance the hanging volume above. The façade will be finished with a curtain wall clad in anodised aluminium. Architecturally, it creates a reflection effect of the sky, natural light and other buildings, a facade that disappears and reappears like clouds. Two remarkable scoops carve the tower to form deep balconies furnished in wood. The recessed form of the building respects and optimizes neighbouring views. A concept of ‘carved deductions’ not only optimizes the views but also strengthens the relationship to the street, to its urban and geographic context. 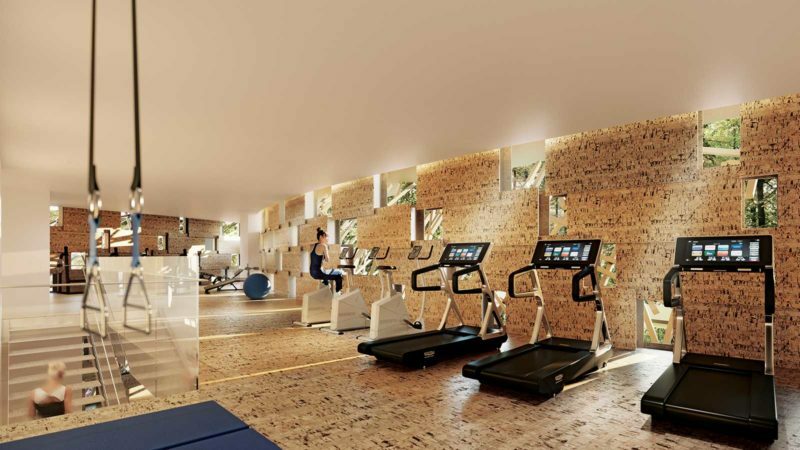 All 188 residents will have the feeling of being close to the ground and nature. While the story that lies behind these deductions is that it creates a symbolic entryway to the building and to downtown Vancouver with views along the street. Kuma’s inspiration by nature is clearly reflected by the ground floor of the building, a Japanese moss garden under arching structures surrounding an amphitheatre shaped form. This ground level green space defines the entrance of the building and is a public amenity that connects nature with street-life. It can be used for various activities such as concerts, small parties or to enjoy a pause in the middle of the city. Above this amphitheatre awaits a swimming pool: a strikingly layered wood standalone wall resembling the childhood game of pick-up sticks inside the concave space’s pool area will be landscaped with a Japanese moss garden. Kengo Kuma is an architect who values traditional Japanese wooden constructions and craftsmanship with a modern twist. His ample use of wood creates intimacy and warmth responds to the abundance of nature in Vancouver being close to Stanley Park. In fact wood disappeared from the city in the 20th century so Kuma wanted to revive the feeling of living with wood and the warmth of wood. However the tower rises at 135 meters (436 ft.), the ground level wooden timber constructions should give people a sense of craftsmanship. 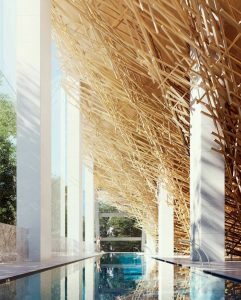 As such, it is a major emblematic element in Kengo Kuma’s architectural design and it is also frequently used in his previous works. The mixed-use development features a wine tasting room, art gallery, music room, double-storey fitness centre, retail space and a unique Waketokuyama Japanese Restaurant. For the first time this restaurant will be based outside Japan. The Tokyo restaurant has two Michelin stars and is considered to be one of the best Kaiseiki restaurants in Japan. Furthermore this elegant project features six levels of underground parking resulting in 271 vehicles spots, 49 electric vehicle charging stations and 248 bicycle stalls . Kengo Kuma Architects and Associates also took care of the interior design for the luxurious residential units in this building. 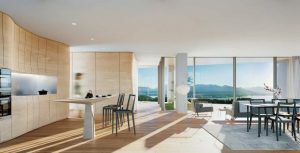 All the units are finished using natural materials, craftsmanship and thoughtful detail such as the organic shape in the units, floor-to-ceiling glazing and open patios. 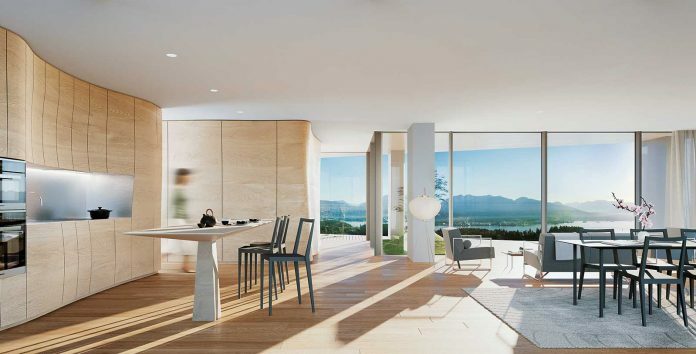 The penthouse unit will have a terrace and swimming pool with magnificent views of English Bay. Some units will feature a Japanese soaking tub on the balcony, also known as a Furo used in a Japanese tea ceremony. By bringing together the Eastern and Western culture this unique project is a sort of cultural exchange. The city itself is multicultural so the details and materials coming from Japan and Asia are chosen carefully to match this cultural exchange. Using materials from other cultures can stimulate the city. 1150 Alberni is an overall experience defined by interwoven layers of textures and themes. The project clearly is prime contemporary real estate with a tribute to the Japanese culture.